The Platform Debate: Author/Speaker Michael Hyatt versus the NSA – Resolved! Please note that since I wrote this post, the issue has been resolved. Woo Hoo! I’m thrilled to report that the National Speakers Association has abandoned the name Platform, which leaves the wonderful Michael Hyatt able to continue his fabulous work to build their platforms. See Shep’s video annoucement. In the wake of the National Speakers Association announcement at its annual convention a few days ago that it was renaming the organization “Platform,” some of us, who are passionate fans of Michael Hyatt — the New York Times bestselling author of Platform: Get Noticed in a Noisy World — have become quite vocal about this poorly researched, dubious decision. For my part, as I shared earlier (and maybe ranted a little) on this Sugar Shock Blog, when I witnessed this brand roll-out, I became both appalled and saddened. Although I greatly respect the National Speakers Association and its many remarkable members, I cannot fathom how a talented brand-name-search committee — which allegedly spent “two years” on this — could have been so in the dark about the amazing Michael Hyatt, who has branded “Platform” in a big way. Or, worse, if they knew about Michael and still proceeded with this move, it’s simply galling. Not only has Michael penned his fabulous book Platform — which is, incidentally, order now a must read for all speakers — but he has created a wonderful Platform University and fabulous Platform Conference. Urge the National Speakers Association leadership to ditch the name change by writing to CEO Stacy Tetschner, who invites your comments about it. Recommend that the NSA apologize to Michael Hyatt. Do better Google searches and more substantive research before picking another brand name that may already be taken. And don’t stomp on the toes of someone, who is, after all, one of your own! Indeed, Michael Hyatt is not only a New York Times bestselling author with a huge platform, but he’s a sought-after, world-renowned speaker, who has done so much to help speakers, authors, bloggers, etc. get their messages out to a wider audience. Also, please post comments on blogs by Daniel Decker, Stu McLaren, Kathleen Ann Thompson, Mike Kim, and Andy Traub, and thank them for coming to Michael’s support. I also encourage you to read these thoughtful posts about this matter from Ryan Avery Stu McLaren, and Skip Prichard. Now, let the fabulous Michael Hyatt teach you about building your own platform. Again, please join me in urging the NSA leadership to reconsider this name change, because Michael Hyatt is already the preeminent holder of the brand, Platform. Please share your comments now. Please see Shep Hyken’s video announcerment about the abandonment of the NSA name change. order now I’m thrilled to report that the National Speakers Association has abandoned the name Platform, which leaves the wonderful Michael Hyatt able to continue his fabulous work to build their platforms. See Shep’s video annoucement. More accurately, I felt very sorry for https://conversionfanatics.com/healthandwellness cheap generic viagra Michael Hyatt, the wildly acclaimed blogger, speaker and New York Times bestselling author of the fabulous book, Platform: Get Noticed in a Noisy World. which, incidentally, is a buy now must read for any speaker or author. How can the NSA do this to https://stetsonpainting.com/whychooseus/ order now Michael Hyatt, who is, in effect, The Platform Man? And consider this: Michael’s platform — at least on Facebook (41,770) and Twitter (224,000) — is far bigger than that of the National Speakers Association, which has only 16,824 fans in its private Facebook group and only 11,600 followers on Twitter. Sugar and carb addicts, get help to free yourself from your potentially deadly habits on Sat., April 13 at 7 pm at Book Passage in Corte Madera. Indeed, it’s now my honor and privilege to personally guide, coach, educate and empower sugar and carb addicts in the San Francisco Bay Area on Saturday, April 13, which is, coincidentally, two days before a momentous time for me. The program at Book Passage is being presented, thanks to the remarkable organization, Left Coast Writers, a fabulous group that supports new and established writers. Please note that this appearance at Book Passage is my first talk and book signing since the publication of my book, Beyond Sugar Shock: The 6-Week Plan to Break Free of Your Sugar Addiction & Get Slimmer, Sexier & Sweeter. Quickly decode and then welcome (really!) your annoying sugar cravings. Remember the sour scoop about sugar (that it can lead to cancer, type 2 diabetes and even kill you early) when you’re overcome by must-have-sugar-now! feelings. plan, especially after emotionally trying times. your desire for dangerous sweets but still enjoy tasty chocolate treats. You’ll even find out how to get recipes for healthy choco-goodie and get to savor tasty sugar-free desserts. duped by innocent-looking, seductive foods that are actually sugar traps. including Dr. Wayne Dyer, Dr. Christiane Northrup, and Dr. Daniel Amen. Connie’s second book is the eagerly awaited follow-up to her acclaimed bestseller, Sugar Shock! How Sweets and Simple Carbs Can Derail Your Life—And How You Can Get Back on Track, which has been praised by America’s Favorite Doctor, Dr. Mehmet Oz. Now, Connie runs her popular Sugar Freedom Now Retreat (virtual, recorded, and live), which is the companion program to Beyond Sugar Shock. health professionals to help them help their clients. virtually through Facebook, Twitter, LinkedIn, Pinterest, Google+ or YouTube. community center, place of worship or business all across the United States and parts of Europe, including San Francisco, Atlanta, New York, Paris, and Sydney. Please note that all stops are by request only. Apply here to be included as part of the 2013 Sugar Freedom & Forgiveness World Tour. Reveal never-shared secrets to effortlessly let go of your sugar habit and flip on your Sugar-Free Power. Give you 3 simple, powerful tools to stomp out scary sugar cravings as they strike. Help you identify your two biggest obstacles to success. Disclose the single biggest mistake most people make when trying to limit sweets and tell you how to easily avoid it. Share one simple tactic to fast-forward you to success. Personally answer your top question(s). You want to shed excess weight to get slimmer, sexier, and sweeter, as well as happier, positive, and more focused. You want to boost your energy. challenges during either your time of month (your period) or life (menopause). sugar), prediabetes, type 2 diabetes or heart disease. difficulty concentrating, depression, forgetfulness, and lightheadedness. You want to look and feel younger, turn heads whereever you go, and out-perform people 15 years younger. kicks off mid-April in the Western part of the United States. I’ll reach the rest of the U.S. and parts of Europe and Australia later in the year. Apply here, on this Sugar Shock Blog, to be included in this once-in-a-lifetime event. Limited opportunities are available on a first-come, first-served basis. Supermarket Tour, and a 3-session Turbo Charge Your Sugar Freedom private coaching package. is dedicated to my beloved mother, who recently passed away. Fast Forward Beyond Sugar Shock to Get Slimmer, Sexier & Sweeter,” submit your application now. 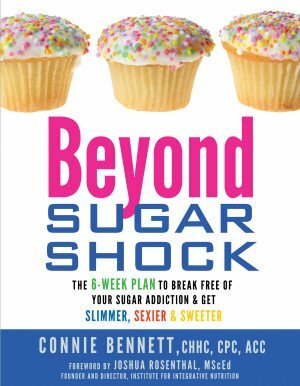 Connie Bennett is a bestselling author (Beyond Sugar Shock and Sugar Shock), an internationally acclaimed transformational speaker, and a sugar-addict-turned Sugar Freedom Coach, who runs the popular Sugar Freedom Now Virtual Course. 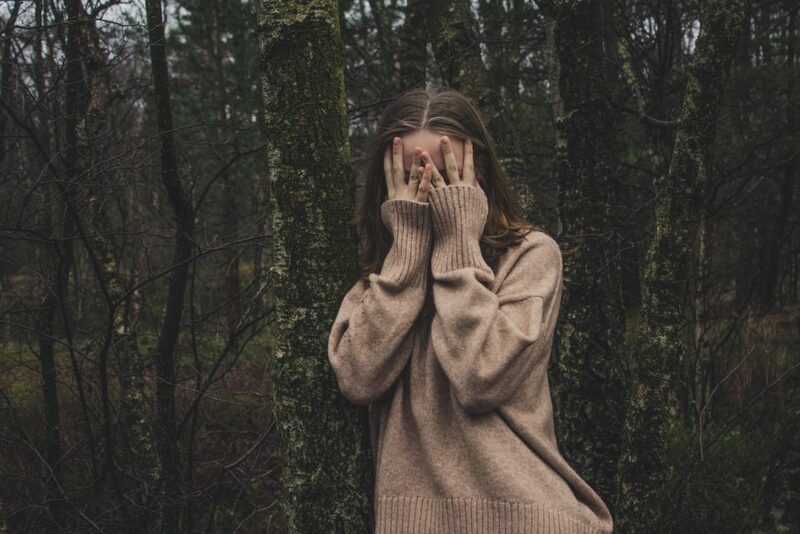 Connie’s sour-to-sweet story began in 1998 when she was ambushed by a whopping 44 mysterious ailments, including crippling fatigue, unpredictable mood swings, severe PMS, and scary heart palpitations. On doctor’s orders, Connie reluctantly gave up her cherished candies, cookies and other “culprit carbs,” and much to her delight, ALL of her symptoms disappeared. Soon, people kept asking Connie her secrets to breaking free, which led to her becoming now known as The Sugar Freedom Coach. 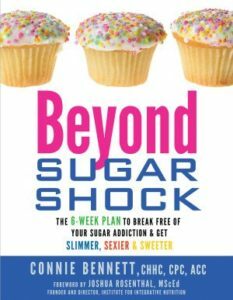 Connie’s new book, Beyond Sugar Shock, has been endorsed by Dr. Wayne W. Dyer and many others. Her first book, Sugar Shock, was praised by Dr. Mehmet Oz. In mid-April, Connie will embark on The Sugar Freedom & Forgiveness World Tour. It is designed to help sugar addicts around the globe easily release their dangerous habit so they can get slimmer, sexier and sweeter — and have fun at the same time.The tour — which also is intended to help people discover that Life is Sweeter without Sweets™ — will raise awareness about the harmful dangers of over-eating sweets and refined carbs. (The average person over-indulges in these fast-acting, non-foods, whether she or he knows it or not.) The Sugar Freedom & Forgiveness World Tour is commemorating Connie’s 15-year-sugar-free-iversary (of mostly shunning those dangerous sweets). It is dedicated to Connie’s recently deceased mother. Connie has been featured by hundreds of media outlets, including “CBS News Sunday Morning,” “Oprah & Friends Radio,” “The Howard Stern Show,” TIME magazine, Woman’s World, Women’s Health, Delicious Living, Shape, The Chicago Tribune, and Detroit News. Connie is a certified life coach, who trained at the Institute for Professional Excellence in Coaching or iPEC; a certified health coach, who studied at the Institute for Integrative Nutrition; and an accomplished reporter, who has master’s of science degree in journalism from Northwestern University’s esteemed Medill School of Journalism. She hosts the popular Gab with the Gurus Show, for which she interviews bestselling authors and experts in a variety of fields, from wellness to relationships to social networking. Get free gifts at Connie’s website, BeyondSugarShock.com, and connect with Connie on Facebook. Woo Hoo!! Today’s a REALLY, REALLY BIG day for me! 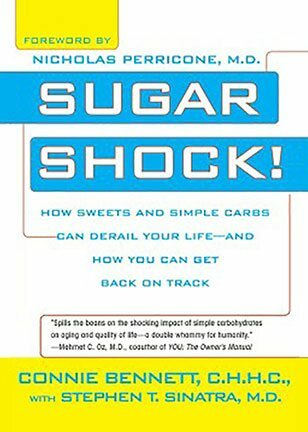 FINALLY, today, 14 years after I desperately kicked sugar on doctor’s orders, my new book, Beyond Sugar Shock, is officially released. It is hitting bookstores nationwide (in the U.S. and Canada). On Monday, it will be published in the U.K. If you buy a copy of Beyond Sugar Shock, please send a photo of you and the book, which can help YOU easily, joyously release your sugar addiction, too. When you send your photo, I’ll even post it here, too. Please note that right now, we’re building momentum for TUESDAY, JUNE 5. On TUESDAY, JUNE 5, you’re invited to tell your loved ones, fans, friends, relatives, and sugar-addicted co-workers — even people you don’t like too much! ( they’re probably high on sugar!) — to buy Beyond Sugar Shock. Find out why this book has been praised by Dr. Christiane Northrup, Dr. Wayne W. Dyer, Dr. Daniel Amen, Brian Tracy, Bernie Siegel, Dr. Jonny Bowden, Dr. Joe Vitale, Marci Shimoff, Kathy Smith, Jacob Teitelbaum, M.D. and many others. Keep checking back here to the Sugar Shock Blog for more news about our Beyond Sugar Shock Book Launch on TUESDAY, JUNE 5, when we seek to HELP sugar addicts worldwide. And make sure to SAVE THE DATE, TUESDAY, JUNE 5 to spread the word about Beyond Sugar Shock. Do you have a large mailing list? If so, sign up here to join my book launch on Tuesday. Please help me to help millions of sugar adddicts or carb addicts around the world. On Tuesday, June 5, you’re cordially invited to join the launch of my second book, Beyond Sugar Shock, which was recently released in the United States, Canada and the United Kingdom. 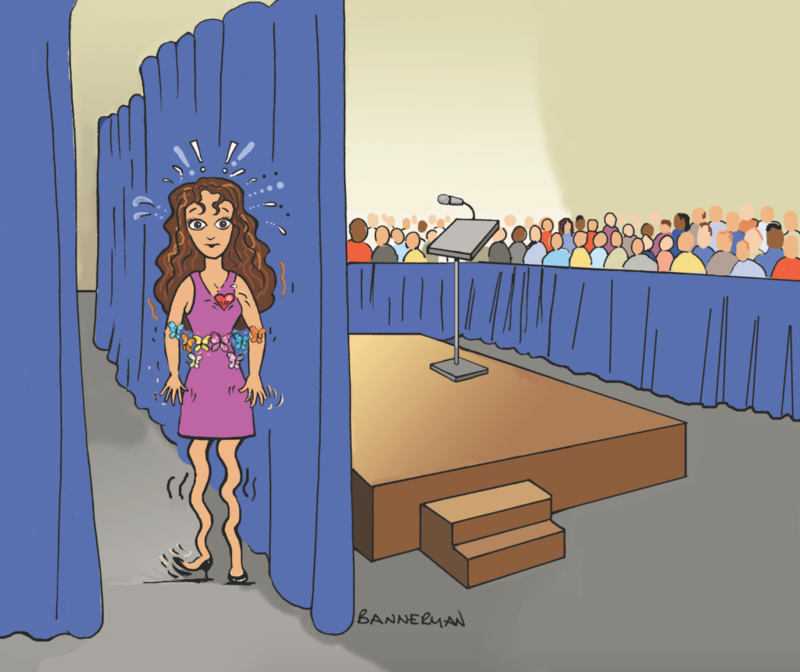 If you’ve never participated in a book launch before, let me explain how it works. Trust me, it’s really easy, personally rewarding, and even potentially lucrative (later on) to join us! So, on Tuesday, June 5, you’re invited to send out a beautiful email prepared by my wonderful publisher, Hay House, to your entire mailing list. We’ve done more to make this easy for you. Go here to get copy for your ezine (long, medium or short in length), as well as Facebook posts, tweets and LinkedIn comments. Join our massive grass-roots effort to reach people who need help to gain control over their sugar or carb addiction and Get a Life that Rocks™, as I like to put it. In addition, the typical U.S. resident — you again? — unthinkingly takes in nearly 200 pounds per year of sugar’s culpable cousins — refined white-flour products such as white bread, white-flour pasta, white bread, mashed potatoes, and white rice. All these processed foods — what I call quickie carbs or much-like sugar carbs — also are speedily metabolized in our bodies. All those sweets and refined carbs put you into Sugar Shock often. That means these quickie trigger elevated blood sugar levels, repeatedly over-stimulate insulin release, cause excessive inflammation, and pave the way for nearly 150 devastating, mostly preventable diseases or conditions, including obesity (of course), but also heart disease, blood sugar disorders (from hypoglycemia to type 2 diabetes), cancer, and even Alzheimer’s disease. To put it bluntly, if you put yourself into Sugar Shock on a regular basis — as most people in civilized countries do — you can get fat and sick, and die well before your time. Will You Join Us to Help Save People’s Health, Moods, Inner Peace, Relationships & More? So will you join our worldwide effort to help millions of people worldwide to shed pounds, become more energetic, reverse or halt type 2 diabetes, prevent heart disease or cancer, and even boost their libido? Yes, quitting or cutting back on sugar and refined carbs can do all of that — and much more, as you can learn in Beyond Sugar Shock. How Will this Book Help Sugar or Carb Addicts? And How Did it Come About? You’re probably wondering why I think this book is special. Well, in Beyond Sugar Shock, I present a six-week Mind-Body-Spirit program, that gently, compassionately takes sugar or carb addicts on a fun, empowering adventure so they can easily, joyously release their dangerous, potentially deadly habit. Briefly, here’s the back story. Beyond Sugar Shock has been about 14 years in the making. Back in 1998, when I quit sugar on doctor’s orders, I didn’t know how to go about doing it. So while kicking sugar, I began to create simple techniques to help me easily let go of my over-attraction to those tempting sweets. In Beyond Sugar Shock, I share these easy tools. Beyond Sugar Shock — which has been endorsed by Dr. Wayne Dyer, Dr. Christiane Northrup, Dr. Daniel Amen, Joe Vitale, Marci Shimoff, John Assaraf and many others — gives sugar and carb addicts what they need and seek. (That’s my intention, at least! Get more marketing copy to use in your ezine, on Facebook or LinkedIn. You even get some fun tweets. Attention, Bloggers: Another way to join our Beyond Sugar Shock Book Launch is to blog about this book or to post a review. We’re also offering you two books — one for you and one to give away as a prize. For details on the Blogger Book Launch, please contact me, and I’ll send you details. Note to Colleagues of the Institute for Integrative Nutrition: When you get involved with my book launch, I’ll help you help your sugar-addicted clients. In fact, on June 28, I’m hosting a private program just IIN-ers. Please contact me to get details. Sign up now to join the Beyond Sugar Shock Book Launch. Share this special email from my publisher, Hay House, to either your mailing list or your group of 50 to 100 friends, colleagues, and relatives. Get pre-written marketing copy for Facebook, LinkedIn, Twitter and your ezine. By the way, you may be wondering why I’m holding a grassroots effort. Suffice it to say that in these times of social media, as an author, you have an amazing opportunity to directly reach many of the people you serve, which is very exciting. Also, did you know that launching a book is a huge endeavor, and if your budget is limited, you need to use some innovative ways to get the word out? That’s why I am so very grateful in advance for your help so that I can help sugar addicts worldwide. So thank you from the bottom of my heart for joining us! Questions? I’m here for you. Just ask away. Comments (0) | | Categories: Announcements, Beyond Sugar Shock, Book Promoting & Marketing, Dream Big, Hay House, Help for Sugar Addicts, Take Action! Tomorrow, my book, Beyond Sugar Shock, will be officially published. In honor of my book’s release, I’ll be hosting a number of free events, and other wonderful health and empowerment experts are inviting me on their programs. Join me tonight for a complimentary Webinar Tonight at 8pm EST / 5pm PST, presented by Joseph Varghese, Strategic Focus Coach of SuccessCircles.com. Seriously, in this free webinar with Joseph and me, you’ll learn simple sweet secrets to erase your sweet tooth. This webinar is for you if you often experience unexplained ailments (think headaches, difficulty concentrating and mood swings). Or perhaps you just can’t say no to sweets or those tempting processed carbs (I call them culprit carbs). I know how you feel. You’ll get to hear my story about how I got healthy and cut the cord from my sugar obsession. Join Joseph and me tonight for this free webinar so you can find out how to get slimmer, sexier, and sweeter. Register now to reserve your spot and learn how education, encouragement, and empowerment can transform your health! FYI, space is limited to this free webinar so hurry now and register for our webinar. immediately, you’ll receive a confirmation email containing information about how to join our webinar. Beyond Sugar Shock, my next book, will be officially published Friday, June 1 by Hay House. It is available for pre-order now on Amazon and from my publisher, Hay House. In honor of the publication of Beyond Sugar Shock, you can attend a number of free events (virtually, on the Web, via teleseminar or live) as part of the Book Launch. Of course, you’ll also be able to watch or listen to interviews I give on TV or radio shows, and read many articles either from me or about Beyond Sugar Shock on various print publications, blogs or websites (such as on the Huffington Post and Heal Your Life). Most Beyond Sugar Shock Book Launch activities will take place on the official book launch day on Tuesday, June 5, but a number of other events are held the week before and that first week in June, the week from Monday, June 4 through Friday, June 8. We’re presenting a number of events the next week, too. Below, you’ll find a schedule of activities planned to date. We’re adding events and details so often that you’ll want to check back here often for updates. But first, though, I’d like to extend my heartfelt thanks to Beyond Sugar Shock’s many amazing supporters, who are bestselling authors, admired thought leaders, or adored health or empowerment gurus. My deep gratitude goes to all wonderful 48 people–so far–who endorsed Beyond Sugar Shock and are now spreading the word about it. Read my post here to see endorsements from the empowering, inspirational Dr. Wayne W. Dyer. Dr. Daniel Amen, Dr. Bernie Siegel, Brian Tracy, Dr. Joe Vitale, Marci Shimoff, Janet Bray Atwood, John Assaraf, Dr. JJ Virgin, Dr. Oz Garcia, Dr. Jonny Bowden, Dr. Dharma Singh Khalsa, Mark Sisson, and Debbie Phillips. You’ll also see comments from fellow sugar experts Jeff O’Connell (Sugar Nation), Dr. Jacob Teitelbaum (Beat Sugar Addiction Now! ), Dr. Richard J. Johnson (The Sugar Fix), Jill Escher (Farewell, Club Perma-Chub), and Kathie Dolgin (a.k.a. “High Voltage.”) And, find praise here for Beyond Sugar Shock from such remarkable Hay House authors Dr. Christiane Northrup, Colette Baron-Reid, Dr. Ken Druck, Donna Gates, Lauren Mackler, and Caroline Sutherland. I’d also like to take a moment to thank the Institute for Integrative Nutrition–which I attended from 2005 to 2006–and its pioneering founder/director Joshua Rosenthal, who was kind enough to write the foreword. You can can read endorsements here from Institute for Integrative Nutrition (IIN) grads Jared Koch, Patricia Moreno, Alex Jamieson, Stacey Morganstern and Carey Peters. Week 2 of my Sugar Freedom Now Course. 5 pm PDT or 8 pm EDT. Enroll in this private program here. Interview on You Can Heal Your Life show with Kerri Richardson on Hay House Radio. Runs for four Fridays at 11 am PDT. Live Event: Wed., May 30 in San Francisco: If you’re in the Bay Area, I invite you to attend the Bestseller Book Launch and Author Spotlight party. At this event, bestselling author Marci Shimoff and several others of us will be featured. Other non-fiction authors featured include: Jennifer Flaa (The Happiness Handbook), Melissa Steach (The Housing Project), Dane Rauschenberg (138,336 Feet to Pure Bliss), Zoe Sexton (FLIRTonomics), Sherry Berman and Julie Gleeson (Inside Job), Carrie Chavez Hansen (The Final Nesting Place), Peggy Harper Lee (Spoiled), and Nicole DeAvilla (The 2 Minute Yoga Solution). The event is presented by Alicia Dunams, CEO of the Bestseller in a Weekend. To join us, sign up here. Private Webinar presented by marketing strategist Joseph Varghese. At 5 pm PDT (8 pm EDT). Sign up for the webinar here. Monday, June 4 at 9:15 am PDT: Interview with Jill Lane in Dallas. www.oneliferadio.com. Today, it’s my pleasure to be interviewed by Jill Lane, an expert in the fields of nutrition and exercise physiology. Jill — who is pasionate about helping pro athletes and high achievers attain max strength, quick recovery, heightened energy, sharp focus and optimal body fat for peak performance — was oversaw the meal planning and recipes, which are included in Beyond Sugar Shock. Some of her current and past clients include coaches and players from the Dallas Cowboys, Dallas Stars and Cleveland Browns as well as a variety of tennis and golf pros. As I’ve discovered upon interviewing Jill, her colleagues say she is gifted at turning complicated biochemistry into simple concepts and action steps that produce success. Monday, June 4 at 10 am PDT: My Gab with the Gurus Show focuses on vegetarianism and Meatless Monday. For the first day of the Beyond Sugar Shock Book Launch Week, listeners will learn how going meatless once a week may reduce your risk of chronic preventable conditions like cancer, cardiovascular disease, diabetes and obesity, as well as reduce your carbon footprint and save precious resources. My guests are a Meatless Monday representative; gourmet chef/health coach Alex Jamieson (who appeared on “Oprah” and “Super Size Me” and is author of Living Vegan for Dummies and The Great American Detox Diet); and Judith Kinsbury, founder of the popular SavvyVegetarian.com blog. Both authors offer recipes, which appear in my book, Beyond Sugar Shock. In honor of Book Launch Week, Gab with the Gurus listeners will have a chance to a copy of my book, access to my Sugar Freedom Now Course, and even time with me. See this: http://www.blogtalkradio.com/gabwiththegurus/2012/06/04/meatless-monday-alex-jamieson-savvy-vegetarian-go-beyond. Monday, June 4 at 11 am: The dynamic host and radio show veteran Diane Ray interviews me on her popular, fun “I Can Do It Hour!” on www.HayHouseRadio.com. If you haven’t listened yet to Diane’s inspiring show, you must! On this weekely show, you have a special opportunity to get entertained and educated each week by empowering, compassionate Hay House authors. In addition, you can call in and ask her guests questions. As I’ve mentioned previously, I’m honored that Hay House is the publisher of my book, Beyond Sugar Shock . My article, “My 14 Years Without Sugar: Reflections on a Sour Life Turned Sweet,” runs on www.HealYourLife.com. Stay tuned for the exact link. In the article, I tell how how I made the transition from sugar addict to Sugar Freedom Coach. For those of you struggling with your addiction, you’ll learn about just how bad it got for me. Hope, Healing and WellBeing Show: Catch my interview all week with Mary Treacy O’Keefe, breast cancer survivor and co-founder and President of Well Within, a nonprofit holistic wellness resource center in St. Paul, MN. Mary’s goals are to help people reduce their levels of anxiety and foster hope, healing and spiritual growth. Mary is also trained as a Cancer Guide and as a Mind, Body Skills facilitator by the Center for Mind Body Medicine in Washington, D.C. Mary’s first book, Thin Places: Where Faith is Affirmed and Hope Dwells, received Honorable Mention from the national Independent Publishers Book Awards. She is currently completing her next book, Meant to Be: Do Things Really Happen for a Reason? Bestseller Book Launch: Bestselling authors, bloggers, health coaches, low-carb experts, former sugar addicts and those who were kind enough to endorse Beyond Sugar Shock will spread the word about this book to their friends and fans. Would you like to join our massive effort to help people shed pounds, become more energetic, and even boost their libido? To join our campaign, go here: http://tinyurl.com/BeyondSugarShockBookLaunch Special thanks to Hasmark Services for helping to coordinate this massive effort. Facebook Photo Campaign re BarnesAndNoble Stores: That first week in June, you’ll be able to find Beyond Sugar Shock on book tables in front of BarnesAndNoble stores nationwide. Details coming soon about the photo contest, in which you’ll be invited to submit photos of you in your local bookstore. Details coming. Beyond Sugar Shock Blog and Article Contributions. You’ll be able to read my guest posts on a variety of health blogs, low-carb sites, and news sites. In addition, you’ll be able to hear me interviewed on low-carb podcasts. You’ll also have a chance to read reviews of the book–favorable, I hope! Return here soon for details. Typepad Features Sugar Shock Blog & Joint Contest on Typepad and This Blog: Typepad, where I’ve been hosting my Sugar Shock Blog since June 7, 2005 (here’s my first post), will feature my blog on Everything Typepad. Not only that, but Typepad and this Sugar Shock Blog will jointly offer a contest. A winners will get one year subscription to Typepad. FYI, this goes to someone who isn’t already blogging here. (Are you listening, you savvy, strong-voiced readers?) By the way, it’s okay if you’re already re using a different provider to blog at present. In addition, one person will win both a signed copy of Beyond Sugar Shock and admission to my companion Sugar Freedom Now Course. Stay tuned for details about the contest. Get Your Free Gift When You Purchase Beyond Sugar Shock: A Life-Changing Beyond Sugar Shock Freedom Mind Movie: Starting today, when you purchase a copy of Beyond Sugar Shock, you’ll be able to get your own fun, free, uplifting Beyond Sugar Shock Freedom Mind Movie. In case you don’t know yet, a Mind Movie is a visualization tool — it’s actually a short 3-minute video or digital vision board. It provides a picture of your perfect life by offering a combination of positive, present-tense affirmations, reinforced with powerful photos and images and your most emotionally inspiring music. In other words, Mind Movies is dedicated to helping you reach your greatest goals through the power of the Law of Attraction. We’ve created a Mind Movie for you, because many of you may be focusing more on the fact that it’s so hard (your words, not mine!) to let go of sugar. This gift will help you get in the right frame of mind. Not only that, but it will help you feel and materialize your ultimate dream life while being sugar-free. It’s simple to use, too. All you do is watch your Beyond Sugar Shock Freedom Mind Movie every morning and night to help manifest through the Law of Attraction everything you want to be and everything you want. Your Mind Movie will help you to take your ideas from the abstract and “wish” state into a reality in a short period of time. Stay tuned for my upcoming program, when I interview Natalie Ledwell, co-founder of Mind Movies, and when Natalie interviews me on The Inspiration Show. By the way, Mind Movies have been endorsed by personal development gurus like Bob Proctor, John Assaraf, Bob Doyle and Joe Vitale. And Mind Movies has thousands of happy, thankful customers, who have manifested their dreams into reality. Stay tuned for your special sign-up page to get your Beyond Sugar Shock Freedom Mind Movie after you purchase your copy of Beyond Sugar Shock. Tuesday, June 5 at 10 am PDT (1 pm EDT): Interview on the Marketing Club on BlogTalk Radio. (Connie’s Disclosure: I’m very partial to BlogTalkRadio, because that is where I host my Gab with the Gurus Radio Show.) The Marketing Club is designed to help BlogTalkRadio to better market and monetize their shows. The show is geared to both new and veteran hosts and it covers topics like promoting on social media, attracting advertisers & sponsors, etc. The show is held every other Tuesday for visual presentations and Q&A. You also can listen to archived audio recordings at your leisure. You can listen to the first show here. Speaking of BlogTalkRadio, I invite listeners to check out my Gab with the Gurus Show, on which I interview experts in health, wellness, personal empowerment, sugar addiction, weight loss, fitness, entertainment, and much more. Previous guests have included Dr. Mehmet Oz, Marilu Henner, Suzanne Somers, Dr. Joe Vitale, FlyLady (who’s coming back again soon), Montel Williams, Colette Baron-Reid, and many other experts in health, personal empowerment, Law of Attraction, entertainment, and other topics designed to help you Get a Life that Rocks™. Tuesday, June 5 at 11 am: The Wellness Journey: Lynnis Woods-Mullins, founder of PraiseWorks Health and Wellness, will interviewe me on her show, “The Wellness Journey,” which airs on www.PraiseWorksHealthAndWellnessNetwork.biz. You’ll get a specific link shortly. 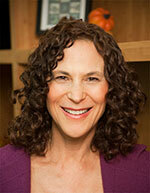 Lynnis is a holistic health coach, and she has been in the world of nutrition and fitness for 25 years. Like me, Lynnis is a graduate of the Institute for Integrative Nutrition. ‘ first love and passion has always been dance. Lynnis has over 40 years’ experience in performing and teaching modern, jazz, ballet, and Praise Dance. Lynnis’s main mission is to educate women on the importance of achieving total wellness for the mind, body and spirit. PraiseWorks targets all areas of a woman’s physical, spiritual and emotional needs through coaching, holistic education and fitness. Tuesday, June 5 at 1 pm to 1:30pm PDT: Live chat on the HealYourLife.com Facebook page. This is your chance to quiz me about whatever you like — about agave, artificial sweeteners, whether or not sugar is addictive, about my sugar history, etc. Most importantly, you can get some quick tools — I call them Sugarfree Starter Secrets — so you can immediately begin to shed that access weight, stabilize your moods, and improve your concentration. These are tips to help you start to get out from under the grip sugar has on you until your copy of Beyond Sugar Shock arrives. By the way, I urge you to stump me! I love when I don’t have the answer, but I promise to look up anything that stumps me. Tuesday, June 5 at 5 pm (8 pm EDT): Teleseminar with a Special Guest. Join me as I bring on one of my favorite health and wellness experts, who will tell you about an amazing way to lift yourself to a higher level. You will learn about a wonderful surprise we’ve planned for you as part of the Beyond Sugar Shock Book Launch. When you attend this program live, you’ll have a chance to win a copy of my book, Beyond Sugar Shock. You also may be able to win free admission to my upcoming Sugar Freedom Now Course, which begins July 11. Details and sign-up sheet are coming soon. Make sure to check back here for information on this Sugar Shock Blog. Tuesday, June 5 at 6 pm PDT (9 pm EDT): I’m interviewed for a Building Strength Webinar by David Ajibade (pronounced aah-jee-bah-day), M.B, B.S., M.D., MMGT, who has trained in both general medicine and radiation oncology. He also has a Master’s degree in Business Management, is a published author, former college professor, and a speaker and educator in the fields of health and human potential. He seeks to help people understand how their minds and bodies work. Other Events on Tuesday, June 5: Would you like me to speak to your group via webinar or teleseminar? Or do you have an idea for a radio or TV show for which you think I’d be ideal? Or what blog(s) do you think should feature Beyond Sugar Shock or me? It would be my honor and privilege to help you, your friends, loved ones, and colleagues. Just invite me here, and let’s make it happen. Wednesday, June 6: Sugar Addict? Jeff O’Connell Warns Our Sugar Nation. – On my Gab with the Gurus Show, I’ll interview Jeff O’Connell, author of Sugar Nation: The Hidden Truth Behind America’s Deadliest Habit and the Simple Way to Beat It. He’ll share how he was once the picture of health and even a health expert (writing for Men’s Health), but he was headed for Type 2 diabetes. He then went on an 18 month-long quest to improve his health through exercise and a low-carb diet. Next, Jeff — now editor-in-chief at Bodybuilding.com, the Internet’s largest fitness site — will interview me about Beyond Sugar Shock. Listeners will be able to win a free copy of my book and admission for 1 to my upcoming “Sugar Freedom Now Course.” http://www.blogtalkradio.com/gabwiththegurus/2012/06/06/sugar-addict-jeff-oconnell-warns-our-sugar-nation. Thursday, June 7: Week 4 of my Sugar Freedom Now Course. 6 pm PST (9 pm EDT). Sign up here. 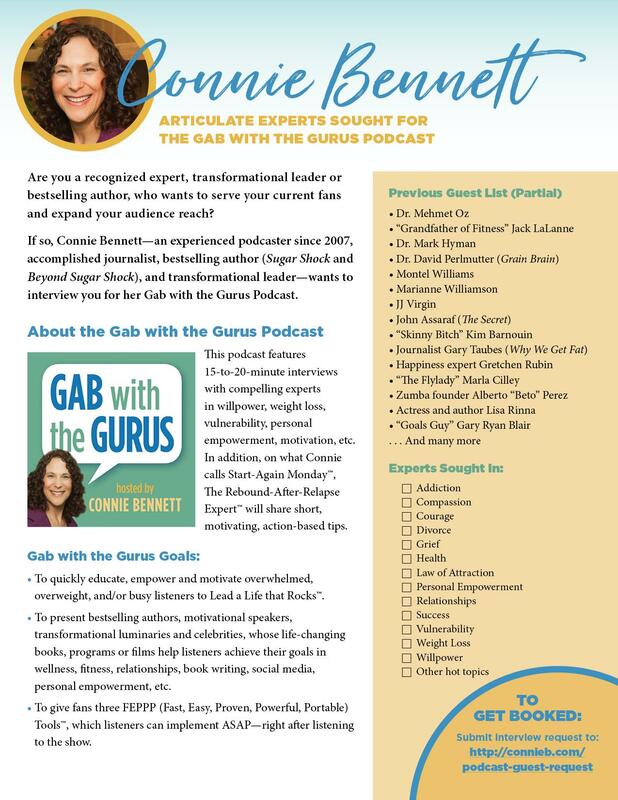 Friday, June 8: Special Gab with the Gurus Radio Show to Thank Gurus who Endorsed My Book: To thank the wonderful people who’ve endorsed my book Beyond Sugar Shock, I’ll be interviewing some of them on the last day of my Book Launch Week. Stay tuned for details. Monday, June 11: Renowned nutritionist Marion Nestle appears on my Gab with the Gurus Radio Show. Tuesday, June 12: Interview on my Gab with the Gurus Radio Show with Hay House author Julie Daniluk and others. Wednesday, June 13: Interview with empowering Hay House authors on my Gab with the Gurus Radio Show. Lots more info to come. Keep checking back to this www.SugarShockBlog.com to learn about other exciting things planned. Thursday, June 14: Week 5 of my Sugar Freedom Now Course. 5 pm PST (8 pm EDT). Sign up here. Wednesday, June 20: Special Gab with the Gurus Show, Sugar is Toxic: Scientists Share Proof. Stay tuned for details. Thursday, June 21: Week 6 of my Sugar Freedom Now Course. 5 pm PST (8 pm EDT). Sign up here. Wednesday, June 27: Sugar is Toxic: Neuroscientist Dr. Nicole Avena is one in a series of gurus to discuss this topic. In this show, you’ll learn about sugar’s addictive nature. 9 am PDT. (12 pm EDT). Listen live or later. Thursday, June 28: Bonus for Members of my Sugar Freedom Now Course. 5 pm PDT (8 pm EDT). Sign up here. New Sugar Freedom Now Course begins. Wed., July 11. 5 pm PDT (8 pm EDT). Sign up coming. Would you like to invite me to talk to your group either live or via teleseminar? Just invite me here.